The Duchy of Cornwall is a county with two different faces. On the one hand there are holiday resorts bustling with visitors, and on the other... a stunning coast where you can fish in peace away from the crowds. IT NEVER FAILS to amaze me that sea fishing is a fraternity of brothers, and sometimes sisters, who unite in the joy of trying to outwit a fish with a morsel of bait hanging from a metal hook. Nothing beats spending time with anglers who are passionate about their sport, and every time I fish with a different angler I come away with spirits lifted, knowing that so many people get a genuine thrill from their sport. Martin Cook is one of these people – by his own admission, a regular kind of guy who works as a general builder and lives in a sleepy part of Cornwall that most holidaymakers don't even know exists. He's been fishing since the age of five, and loves it more every year. Living in a perfect part of the world for sea fishing means that he is literally spoilt for choice when it comes to choosing somewhere to go, but Martin has a particular love of the Roseland peninsula, that glorious piece of coastline stretching from St Austell to St Mawes. While he can be found around Falmouth and Newquay too when the conditions are right, he prefers the quiet cliff paths of this rugged but easily accessible peninsula that lead towards many treasured marks. What of his favourite species? I am over the moon to report that Martin gets the biggest kick out of catching the hard-scrapping ballan wrasse that abound in these waters. Wrasse will forever be something special to me as well, but I've never caught one anywhere near as big as Martin has. Cornwall's Roseland peninsula seems to be so tucked out of the way that too many anglers don't know it is even there. While the rugged north coast will always attract a high percentage of anglers who are drawn to the sheer splendour and quality of the fishing, the gentler inclines of much of south Cornwall hide some great fishing spots as well. To those in the know, areas like the Roseland peninsula are simply covered with great fishing spots that are very much under-fished. A wonderful array of high-sided Cornish lanes will get you to this part of the world, but be sure to consult a detailed map before setting off – take it from me, it is very easy to get lost in this part of the world. Martin Cook and his fishing fanatic brother Kevin Andrews tell me that most times they go fishing they consider it very rare to bump into anybody else. This is my kind of place. IN the current age of the computer being so important to virtually all of us, it is interesting to learn that Martin places great value in good quality fishing forums. I am sure that many of us were at first suspicious of these online facilities that allow for a virtual getting together of all kinds of anglers, but in time I have come to see their value, just like Martin. 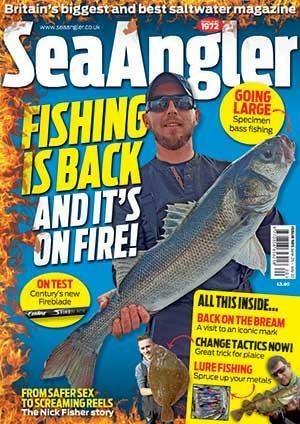 While fishing magazines like Sea Angler will always serve a purpose that no website or forum can replicate, to many anglers a lively fishing forum is another way of learning and communicating about fishing, plus, of course, they are generally very up-to-date with local information. I know of plenty of anglers who have ended up fishing together via a forum. Martin actually approached me through an angling forum and asked if I would like to come wrasse fishing with him. I would have been mad to say no. I am one of those people who knows far too little about the south coast of Cornwall, and so I jumped at the chance to see some more of it with a good local sea angler. Martin's best wrasse to date weighed in at 7lb 8oz. That is a monster wrasse by anybody's standards, but I know he is quietly confident that this fish can be beaten, and he fancies some of his local marks to do the job. What is it about wrasse fishing that so grabs sea anglers? I have thought about this long and hard and can come to no specific conclusion, other than it is a very true style of UK shore fishing that lends itself to out-of-the-way places and hard scraps from dogged fish that can at times feed quite voraciously. If you find these fish feeding hard then you are in for a treat, but don't for one second think that they are pushovers. Targeting big wrasse requires real skill and dedication, much like when going after other specimens, and that moment when a big fish breaks the surface is for many anglers the high point of their fishing. And who am I to argue? I HAVE said it before and I will no doubt say it again, but I place great value in what an angler actually carries with him to go sea fishing. Too many of us have at times been guilty of taking far too much for a fishing trip, so I was pleased to see how little gear Martin was carrying for a session. Why take everything when you know where you are going, and you have a rough idea of how things are going to pan out? Martin was carrying a small rucksack, rod, reel, net and some bait – no more, no less! Martin and Kevin keep things really simple for their own wrasse fishing, preferring to combine the right tackle with good quality bait, a fundamental understanding of their quarry, and, of course, a good knowledge of marks, conditions and tides. Martin tends to use a good quality 18lb mainline on a medium-sized multiplier, tied to a 50lb shockleader. A lot of the areas they fish are fairly shallow, so Martin and Kevin like to spread their baits around and try different areas until they find the fish. There is no need for very heavy lines when the ground is not too rough, and the rig need be no more than a running leger and plain lead. Wrasse fishing is almost another expression for losing end tackle, so you might as well keep the end gear as simple as possible and then lose no sleep when you snag up. Understandably, the guys were reluctant to divulge their specific favourite marks, but Martin was keen to point out that a bit of good old-fashioned walking and logical thought would throw up all the necessary marks for a spot of south Cornish wrasse fishing. A lot of the Roseland peninsula is made up of shallow rock marks and sandy beaches, and where we were appeared perfect for plugging for bass. I reckon a gentle southerly or south-easterly wind would put enough life into the water to make things really interesting. The same marks you end up fishing for wrasse will be good for bull huss at night. Indeed, Martin loves to fish for them – an ebb tide always works well for huss. Martin also likes chasing pollack, especially at the numerous rocky headlands that jut out into that bit stronger tidal flow. Bait is the all-important thing when you are chasing a fish such as the wrasse, for the fresher and more appealing your offering, the greater your chances. Martin and Kevin agree on the fact that hardback shore crabs will usually sort out the larger fish, but that ragworms and even limpets will catch you more of all sizes. Martin feels happiest when he can take some crabs and worms to cover the different eventualities. What I really like is that the brothers are totally into a catch and release policy for their shore fishing. While they do not seem to be in the least bit competitive when fishing together, obviously a little bit of good natured banter flies back and forth, especially when one rod tip and not the other might bounce to a bite, but both work together to help land the other's fish. Wrasse will always be something that bit special to me, and I am glad that so many other anglers out there feel the same way. Long may it last.